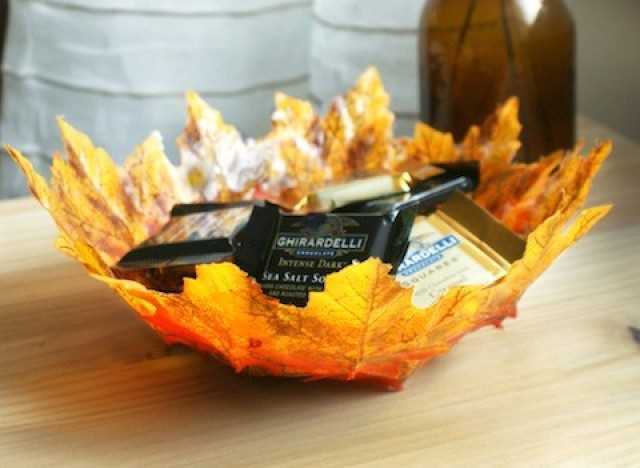 With just a few supplies, you can create a festive leaf bowl with all the colors of fall. All you need is a balloon, some craft leaves, and mod podge. Blow up the balloon to the size of the bowl you’d like. Then, use a foam brush to spread a generous amount of mod podge onto the balloon and attach one of your leaves. Repeat the process, overlapping the leaves, until you cover half of the balloon. Spread a final coat of mod podge over the bowl and let dry. Pop your balloon and you’re done! Add a splash of color to your mantle or wall with some buttons, a frame, and some burlap. Collect several dozen buttons in various sizes and shades of orange, yellow, and white. Next, cover your frame’s cardboard insert with burlap and secure with hot glue. Then, draw a candy corn shape on your burlap to use as a template. Overlap your buttons inside the template to create stripes of yellow, orange, and white and secure them using hot glue. For a quick, festive centerpiece, gather up a few pillar candles (of various heights), some whole cinnamon sticks, some rubber bands, and some twine. Place cinnamon sticks side-by-side around each candle and secure them using a rubber band. Then, wrap twine around the rubber band several times and finish with a bow. Cluster the candles together on a dish or serving plate and place a few craft leaves around them for a finishing touch. If fall wreaths aren’t your thing, why not try a simple pinecone decoration for your front door? All you need is 16 feet of colorful wide ribbon and eight (four-to six-inch) pine cones. Cut the ribbon into eight two-foot-long pieces and glue the bottom of each piece to the top of a pinecone using hot glue. Once the glue is dried, gather all of the ribbons together and stagger them so that the pinecones hang at various lengths. Tie the ribbons into one knot and trim the ends on an angle. Then, hang the decoration on a door hook or nail. Make your very own mini scarecrow to sit on your mantle or shelf with four mini-sized terra-cotta pots (two large, four small), straw, twine, burlap, and some paint. Glue a piece of burlap around one of the large pots and paint a face on it. Next, string four long pieces of twine through the head and knot them together on the inside. String two of the four pieces through the body (the other large pot) for the legs and leave the other two out for the arms. Trim the twine arms, then string the ends of each piece through a small pot and knot on the inside to form hands and feet. Stuff straw into the small pots and the top of the head and glue. Then, glue straw in-between the two larger pots and glue the pots together to complete the head and body. Turn your couch or chair pillows into cozy decorative pieces using an old sweater and a sewing machine or a needle and thread. Measure the size of your pillow, then cut your sweater into two squares that are one inch larger than your pillow size. With the insides of the squares facing out, sew the squares together along the edges, leaving the bottom open. Turn your pillow cover inside out, insert your pillow, and sew up the bottom to complete your cover. Instead of throwing out your empty toilet paper rolls, why not upcycle them into festive paper pumpkins? Keeping your toilet paper roll whole, paint it with festive-colored paint. Once the paint dries, cut the roll into 1/2-inch strips. Then, gather the strips together to form a circle or oval and string a piece of yarn or twine through the middle of them. Before you tie the yarn or twine, place a short, chubby stick in the center to make your pumpkin stem. Tie your yarn or twine tightly around the stem. Then, finish with paper leaves. This entry was posted in DIY and tagged artwork, crafts, DIY, fall, sewing.